Google is doing some cool additions to its Gmail email service. 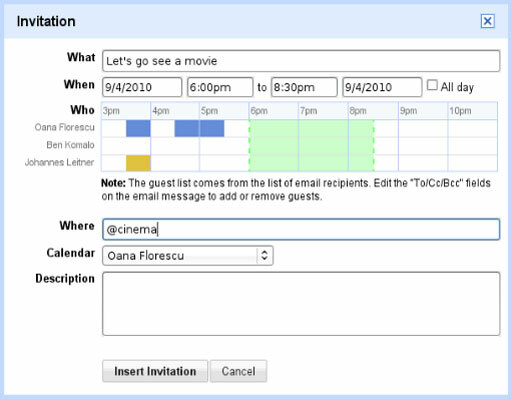 After the new “drag and drop” feature Google introduced the ability to insert and send calendar invitations through Gmail. This new feature will integrate both Gmail and calender and make it easier for calendar invites. You will now see an “insert: invitation” option next to the “Attach a file” link. A small window will appear when you click the link showing your availability and your contacts. Google worked on privacy issues beforehand this time. Your friends need to give to permission to let you view their calendar. Its pretty straightforward from there on where you set your meeting and a preview is displayed. The event is added to yours as well as your attendee’s calendar. This would make things much easier for Enterprise Gmail users. Gmail VoIP Feature Coming Soon – Updated! 1,000,000 Gmail calls made in the First 24-hours! Microsoft Attacks Google with the GMail Man!